Above: Is a gorgeous premium quality Red Ryukin Goldfish, swimming in one of our aquariums, when one of us snapped this picture. This is not a rare fish, but you never see ones like we have. Comments: This is a Premium Pet Fish, and we never see Premium Goldfish like these in any of the live fish stores or online fish stores that we visit. Premium Pet Fish are more energetic, hardier, and have brighter colors with a beautiful metallic sheen. Click here to learn more about our Premium Pet Fish. 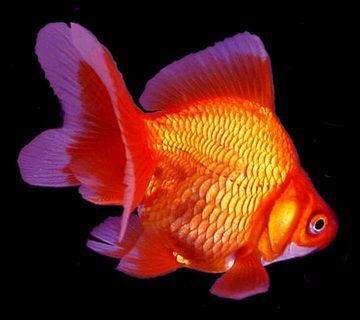 Origin: Fantail Goldfish are one of the most colorful and most popular aquarium fish. Their ancestors originally lived in East Asia, but Goldfish are now found living in aquariums throughout most of the world. There are many color varieties for sale in this store. Maximum Size: In aquariums, these Goldfish can grow to be about 8" long, including their tails. Sometimes very old Goldfish are even bigger. Sometimes much bigger. Behaviors: Most Goldfish are active swimmers but are rarely aggressive. Water Conditions: Goldfish seem to be tolerant of a wide range of water conditions. Probably a pH of about 7 with moderate hardness is best. Most water in the US has a higher pH and is harder but seems to be OK, so it's probably best NOT to adjust the pH or the hardness of the water. Here in our facilities the water is hard and the pH is usually about 7.8. We ship them in this water. Click here for a lot more information about aquarium water conditions. Aquarium Size: It is probably best to house these fish in at least a 30-gallon tank, but more is better. Keep at most one Goldfish per 3-gallon, when they're small. Larger Goldfish need up to 10-gallons per Goldfish. Huge Goldfish need even more water per fish. Live Plants are beautiful and improve the water quality but some plants will be eaten by Goldfish. Aquarium Filter: Bio-Wheel Filters are highly recommended. A Penguin 200B in an aquarium with 20 to 30-gallons of water is OK for a few small goldfish, but a Penguin 350 is the right size for a 30 to 60-gallon aquarium. Click here to learn more about aquarium filters. Gender: It's not easy to tell the males from the females even as they mature. Females are often plumper, but males are plump too! Males get white specs on their gill covers, when they're ready to breed. Click here for more about determining Goldfish gender. Breeding: Goldfish scatter a large number of eggs on plants, or special breeding mops made of nylon yarn. Click here for more about breeding Goldfish. Names: All of the many varieties of aquarium Goldfish are the same species,Carassius auratus. Very ingenious fish farmers have been creating unusual Goldfish varieties for many years. Variations: There are many-many color and shape variations that will interbreed to produce even more variations.